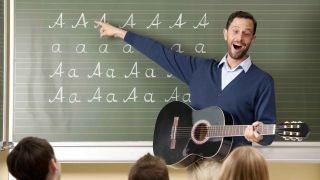 "Here's a chord progression I prepared earlier…"
Yes, we're talking about guitar teachers, and what they 'teach' - or rather, what they don't teach. They take your money and teach you how to play, but then what? They callously punt you out into the world as if their work is done. But it isn't, is it? You are a confused and frightened lamb in a world of electric warrior wolves, and it is bloody carnage out there. You have questions, questions that need answering, and where is your beloved guitar teacher? Nowhere to be seen. Guitars are expensive. Amps are expensive. Hell, even strings are expensive these days. Unless you are the first born son of a billionaire industrialist, a lottery winner, or an actual rock star, the sheer monetary cost of playing the guitar will always be on your mind. GAS can strike at any time, and before you know it you've blown three months' wages on a limited run PRS. The internet is a minefield, eBay a very real menace, guitar ships perennial lairs of temptation. GAS* can strike at any time, and before you know it you've blown three months' wages on a limited run PRS. The internet is a minefield, eBay a very real menace, guitar ships perennial lairs of temptation. At the very least, your teacher should warn you of these perils. Ideally, they'd provide a complimentary spreadsheet detailing exactly how much you have to save and for how long to afford any guitar your heart desires. *Gear Acquisition Syndrome, a very real and financially debilitating disease affecting many musicians with particularly high infection rates among guitarists. 'Play the guitar', they said. 'It'll be fun', they said. What they didn't say, of course, was what it will do to your body. The skin on your fingertips will shred into a messy pulp until finally rock-hard calluses form, forever changing the geography of your delicate little prodders. Your back, your strong young back, will eventually buckle under the strain of years stood with a weight round your neck. Your eyes, forever squinting at pedals in the dark, will fail. And that's before we get to busted toes from dropped cabs, wrists racked with RSI, livers pickled from the booze, lungs leaden from the smoke. It's the price we pay to rock: literal physical pain. How long does it take to get halfway decent at the guitar? A month? A year? 10 years? The answer, as any self-respecting guitarist will tell you, is a lifetime. But they never told you that, did they, when they took your hard-earned cash and taught you D7 and made you feel special and clever; no, they never revealed the horrifying truth, that there will always be more to learn, to explore, to fumble around in the dark trying to find, always another chord, another riff, another lick, an endless stream of things to learn stretching interminably off into the void, forever. Vai is still learning. Clapton is still learning. Hendrix is still learning, and he's been dead for 40 years. Learning the guitar is to commit to a lifetime of never quite being as good as you'd like. Which, when you think about it, plays right into the hands - and hourly rate-lined pockets - of guitar teachers everywhere. Clever. We all know how it's supposed to work. The guy behind the counter gives a price, you give a lower price, and you both work your way towards some point in the middle. Banter ensues, fun is had by all, you feel like you've got a deal and he's bagged a customer for life. Easy. And yet, it never quite works like that does it? Instead of rosy cheeked shopkeeps with a friendly disposition, they are invariably steely-eyed deal-killers with an eye on the bottom line. You're a sweaty mess, an idiot on legs. They name a price, you pay it, and that is that. You need guidance, a steady hand, the key words to say and the correct time to say them. * Damn your guitar teacher and his "chords" and "scales". *We'll help here: before paying, simply ask 'is this your best price', and always be prepared to walk away if you don't get a decent deal - 'tis the secret to all haggling, children. Your teacher might have shown you how to change a string. They might have even walked you through how to clean your fretboard. Any more than that? Unlikely. As a result, there are a staggering amount of guitarists out there whose instruments are filthy, rusting, barely functioning hunks of metal and steel. Necks caked in years of sweat and God knows* what else from your mucky hands, disgusting strings, broken pickups, buzzing necks and badly dressed frets - it's a nightmare, frankly. Some folks aren't even aware that their guitar doesn't have to be that way. It's an entirely preventable tragedy. *And he does know, you filthmonger. The singer is a narcissist and he hates the bass player. The bass player is shagging the keyboard player's missus. The keyboard player is well-liked but always late. Everybody hates the drummer. Welcome, friends, to the twisted dynamics of the average band. There is no human construct more black hearted, more ruthless, more fiendishly Machiavellian, than a rock 'n' roll band. Held together by in-jokes and ambition, most bands are simmering pits of barely suppressed tension. It doesn't matter if you're playing with your best friends or people that answered an ad, at some point you will want to take a top E string and garrotte your way into musical history. You must be prepared for backbiting and infighting, politics, dirty tricks, musical frustration and arch-manipulation. You may also have more fun than you've ever had in your life. Still, would have been nice to have a heads up from Teach about all this, eh? Not everyone wants to be one of those producers sat behind a mixing desk, banging on about headroom and mic placement. That's fine - you got into this caper to be recorded, not to record. But here's the rub: without some very basic recording savvy, how are you going to catch ideas as they happen, or sketch out demos to play to the rest of your band? Beyond that, knowing how to record your guitar to a decent standard should stop it sounding like absolute garbage when you get into the studio. You can't tell some metal-crazy engineer how to make your cherished jazz rig sound all mellow and fruity if you don't have the first clue about recording. Avoid making dogshit records: learn to record! And lo, on the third day, Leo did createth the Stratocaster, and he looked upon his works, and he was pleased. But why should you care what some guy did in the 1950s? Well, you little ignoramus, we shall enlighten ye. It is only by knowing the past that the future becomes possible. Say it one more time with me now: it is only… okay, you get it. The point is, if you don't know about early Strat players jamming the pickup selector switch between positions, or Les Paul's innovations, or the straplock thing with the Grolsch bottle tops, then how the hell are you going to discover new things? Guitar companies will do some of the work for you, but the real change happens down in the trenches, with players pushing their instruments to places they weren't supposed to go (okay, Leo Fender didn't actually play guitar, but you get the picture). How are you supposed to break the boundaries of modern music if you don't know where they are? The dream is real and it is happening. It was raining hard that afternoon, so you took shelter in one of those shops you thought were long gone, with piles of army surplus gear everywhere and a faint whiff of something illegal. You are scared but curious, so you dig around. A flash catches your eye from a dusty corner: the unmistakable glint of a machinehead. You investigate. No. Surely not? Can it be? It's a Les Paul, a Black Beauty no less, and look, there's Gibson on the headstock. Your hands are sweaty. You try to stay cool, stay calm. Don't blow this. 'How much for this, mate?' you ask. 'Um… £150?' Your heart nearly explodes. You immediately proffer your card; you don't have the money, really, but this? This is a sure thing. You leave the shop, and there, in the uncertain post-storm sunlight, you see what you've bought. Cheap corroded machineheads. Body too thin, hardware all wrong. And the final indignity, right there on the headstock: Gobson. You have been duped. You are a fool. Your guitar teacher never taught you how to spot a fake, did he? Guitarists are cool, right, cool for cats, with their hair and their studied nonchalance and their bluejeans - cooler than the average schmuck, certainly cooler than drummers and keyboard players and cello enthusiasts, cooler than a cool thing in a cool box, right? Right. So guitar shops are surely the place to go for laid-back fun times. Except no. Absolutely not. Guitar shops are home to a set of rules so rigid and unbending they verge on the totalitarian. Think you can just pluck any guitar off the wall and start strumming? Think again, scum. Upon entering these hallowed caverns of rockitude, you have silently agreed to a covenant as old as time itself, a mystifying code of conditions and clauses as labyrinthine and convoluted as any legal system. Of course, you'd know all this if your guitar teacher had given you the slightest hint, but no, there you go, grabbing at limited-run Les Pauls and banging out wonky John Mayer solos way too loud. Doomed. You are doomed. We are, all of us, doomed.